I was recently sent some items from Boohoo, including the Models Own – Lilac Dream Nail Polish to come up with a festival nail art for this summer. I looked around and a lot of festival nail art seems to include simple daisy nails or aztec prints so I thought I would move away from that and come up with a more unique idea. I do lots of different nail art posts so if you are looking for some nail inspiration check out some of my previous designs here. I love henna designs and they always look so boho chic, really pretty and a little bit hippy for my festival nail art. I thought that the Models Own Lilac Dream would make a great base for a loose and free gradient background mixes with the gorgeous baby blue from Essence – If I were a Boy. 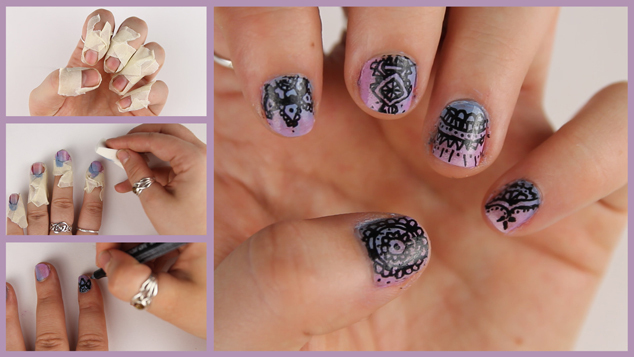 As you will see in the video I used the fantastic Essence Nail Art Tattoo Pen to draw on the detail. I will probably review this on it’s own in the future as it is fantastic, for such a cheap item it draws on brilliantly, doesn’t clog up and gives thin accurate lines. You must apply a top coat after to protect your design with the Essence Nail Art Tattoo Pen though as it doesn’t last long without. Let me know if there are any nail art videos you would like to see me make in the future. What is your festival nail art this summer?